Student employment is more than a job. 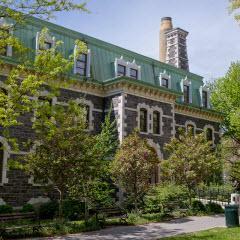 It is an experience which involves a commitment as well as interaction with the Fordham community. Student workers are highly valued by faculty, staff, and students. This hands-on work experience provides a well-rounded education for the student, and also establishes a foundation upon which future employment goals can be built. The Student Employment staff is available to assist you in finding the most suitable job for you. The objective of the SEO is to match students with positions that will enable them to learn and practice valuable work-related skills and to help meet educationally related expenses while studying at Fordham University. Employment on campus is another opportunity to be a part of the Fordham community while earning income to meet your day to day educational expenses. The Academic Year Program (part-time, typically 10 to 15 hours per week) begins the first day of classes and ends on Commencement day. The Summer Program (full-time, 28 hours per week) begins the Monday after Commencement and ends the day before Fall classes begin. The hours a student works are verified and approved by their supervisor. These hours are submitted to Student Employment, who then verifies and authorizes payment of wages. Student receive payment on a monthly basis according to the dates outlined on the Payroll Calendars. Earnings are not credited to a student's university account. Payment is made directly to the student either by check or direct deposit. Download the PDF version of this calendar. *There are TWO submission periods for the month of May. Timely submission of timesheets is required. *** During January Break (1/2 - 1/11), only students given authorization from the Office of Student Employment will be permitted to work during this period. What are the advantages of participating in Work-Study? A work-study job can be enjoyable and profitable. It also builds connections with what may become an on-campus family. Earnings can be used for educational expenses such as books, supplies or travel expenses. Work Experience: Being employed will introduce students to the dynamics of the working world while expanding and developing their job interests and interpersonal skills. Supervisors are also instrumental in assisting students in establishing good work habits and values through the student employment experience. Am I eligible to receive a Federal Work-Study award? Federal Work-Study (FWS) is awarded as part of your financial aid package and appears on the award letter. Once financial eligibility has been established, students are interviewed for placement by Student Employment. An attempt is made to take into consideration the student's interests and abilities as well as the needs to the various departments. Placement priority is given to Work-Study Award recipients; however, all matriculated students at least part-time, have an opportunity to seek employment. Students are considered for employment throughout the year. To be considered for a position as an Alternate applicant, students must file the Free Application For Student Aid (FAFSA) which is available at www.fafsa.ed.gov, be eligible for federal aid, and complete a "Work-Study Placement form." Alternate applicants will be considered for placement on the basis of financial need, skills, and availability of positions. Since funds are limited, please file early. In addition to on-campus positions, students are encouraged to participate in the Community Service Programs funded through Work-Study. Our America Reads and Counts Challenge Program (ARCC) offers students positions tutoring children from Pre-K - 6th grade in reading and math. The SEO will provide guidance to eligible students interested in seeking positions that benefit the community. Students not FWS eligible may also apply for positions such as Ram Van Drivers or Student Aides for Security among others. How do I apply for an on-campus job if I didn't receive Work Study in my package? As vacancies become available, the SEO will phone students for interviews and place students using the following criteria: financial need, skill required and departmental needs. What happens if I do not earn my entire grant by commencement? You are paid for the amount of hours that you have worked. If you do not earn your entire grant by commencement day, you will forfeit the remaining portion. What do I have to do to drive the Ram Van? Ram Van is a service that transports students to and from our 3 respective campuses. Working as a student driver for Ram Van requires additional certification and training, including a driving record review. Students interested in working for Ram Van are encouraged to review the certification criteria found on this site. If you believe you meet the criteria to drive, kindly submit an application through this online form. Ram Van staff will review and reach out on an as-needed basis, based on hiring needs and your academic schedule. Do I need to bring any information with me when I come for my placement interview? At the time of your interview, you will need to bring two proofs of identification. You will need to bring in your social security card or birth certificate and a picture ID or valid passport. What are my responsibilities as a Work-Study recipient? Student workers must abide the guidelines and procedures established by Student Employment. Student workers will be provided with an agreement form, a contract describing the student's rights and responsibilities, and student employment procedures. Students will interview with Student Employment and will be sent for placement to a University department Supervisor or, in the case of tutors, to a school or after-school program Supervisor. The average work-study student works 10 to 15 hours per week during the academic year. Our summer Program is a full-time program which coincides with the University's summer calendar (28 hours per week during four-day weeks). Students may only work the number of hours per week indicated on their Placement Authorization Form. Report to work promptly and as scheduled. Notify your supervisor if you will be late or unable to work. Refrain from conducting personal business on the job, e.g. course assignments and activities, and personal calls or work. Accurately report actual hours worked on the timesheet DAILY and submit timely. Maintain open lines of communication with your supervisor and relay any irreconcilable issues to Student Employment. Provide employer with at least two weeks notice of resignation and email Student Employment the reason and last day worked. Take your job seriously and perform your task to the best of your ability. The work experience you gain is valuable.